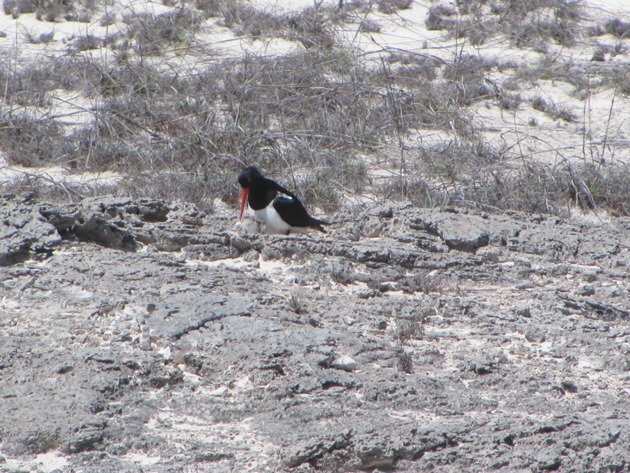 Back in August this year I let you all know of the current situation in regards to Pied Oystercatchers nesting along the 23 kilometres of beach that we monitor each year. We have continued to monitor the nest sites and the pairs of Pied Oystercatchers over the past few months and the birds are really having a tough year this year. Egg loss to predation has been extraordinarily bad this year and all of the nests mentioned in the last post were lost and all of the pairs of Pied Oystercatchers laid a new clutch of eggs. In fact they have not just laid once again, but many pairs have laid up to five clutches of eggs this season. 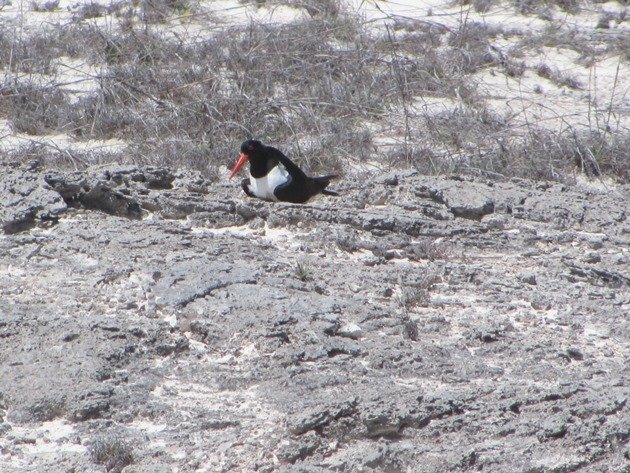 Once eggs have been lost then it usually takes ten days before more eggs have been laid and the Pied Oystercatchers will often use the exact same nest site or one very close by. 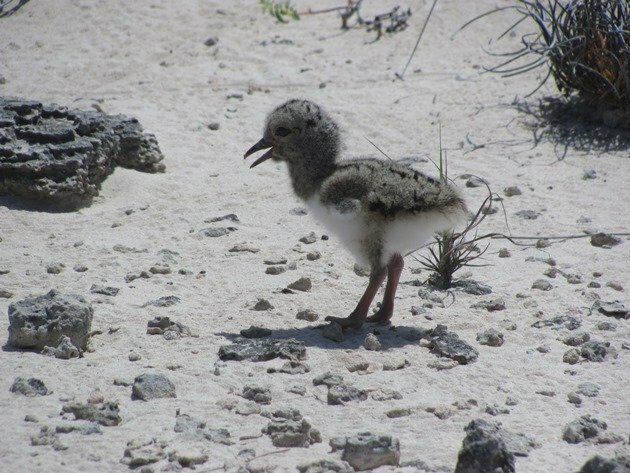 In the case of the two pairs of Pied Oystercatchers that did actually hatch their eggs and have chicks for a few days they did lay once more, but then they failed to even hatch the second clutch and then no longer attempted to breed. Oddly the pair that were so successful last year not only lost their first chicks this year, but the second clutch included a very under-sized egg and the larger egg failed to hatch. They subsequently gave up nesting for the season. One pair of the sixteen pairs of Pied Oystercatchers that we monitor have lost their eggs in such a short period of time after laying that they have laid five clutches this breeding season so far. 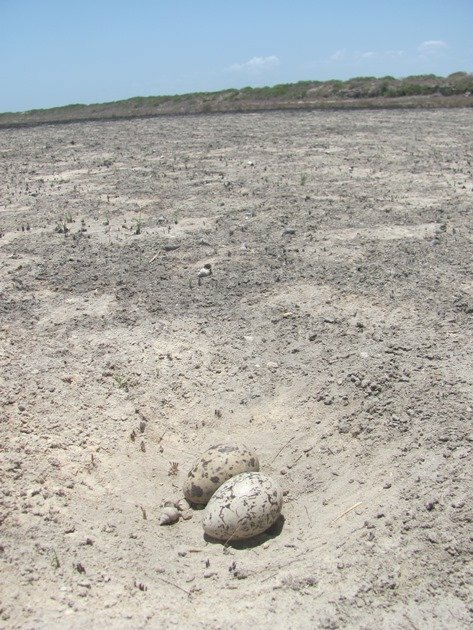 A fire came very close to the nest site of this pair after their fourth clutch had been laid and the eggs survived that ordeal, but were subsequently predated. 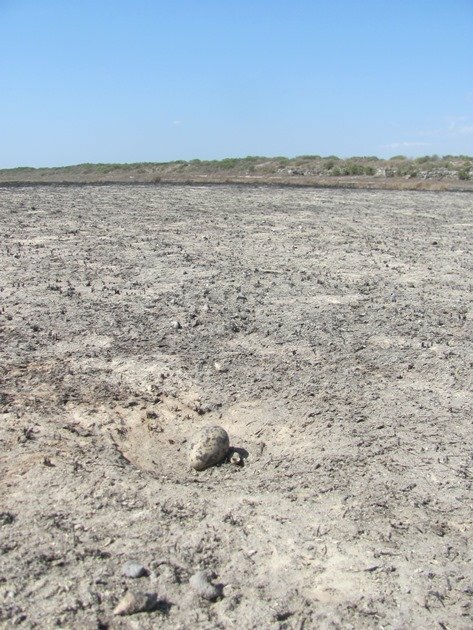 The Pied Oystercatchers then chose to nest in the burnt area itself. 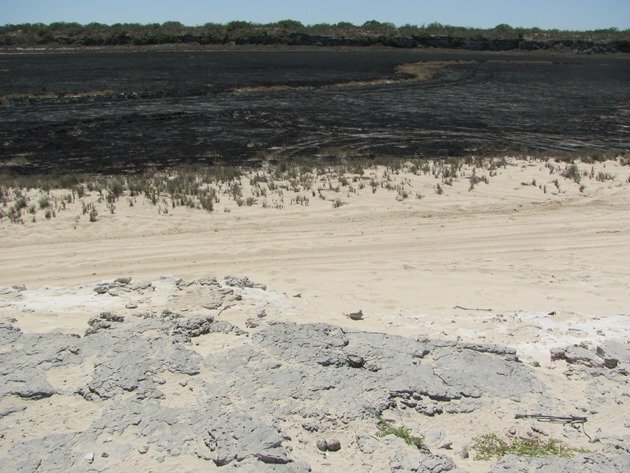 The area is covered in dead hermit crabs that could not escape the fire and they actually have a hermit crab shell in the nest. It has remained there for two weeks. On our first visit there was one egg and the second egg was laid shortly after. The egg that is laid first does not necessarily hatch first and the variation in colouration in eggs enables you to determine which egg is which. 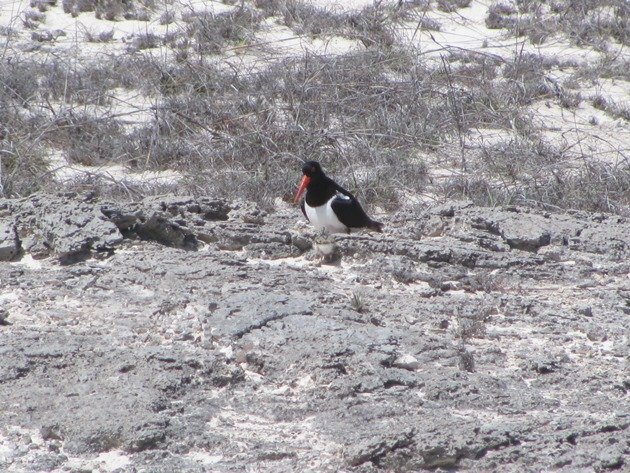 They have now been incubating the eggs for two weeks now, so the pair of Pied Oystercatchers still have two more weeks of sitting and we are hopeful that some of the predation may have slowed down due to the warmer nights. The pair of Pied Oystercatchers have been successful in raising a chick on two occasions that we are aware of in recent years and that was in 2008 and 2011. 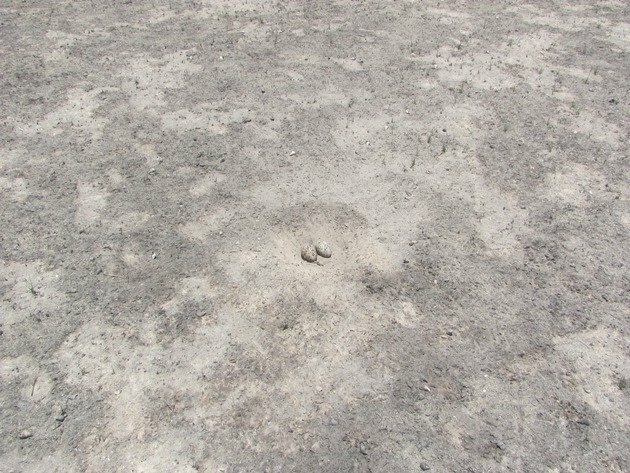 In fact they were the only pair to successfully raise a chick in the 2008 season and only one other chick survived in 2011. In 2007 one Pied Oystercatcher was fledged along this stretch of beach and none succeeded in 2009. There was only one that survived to fledge in 2010, two in 2011 and two in 2012. 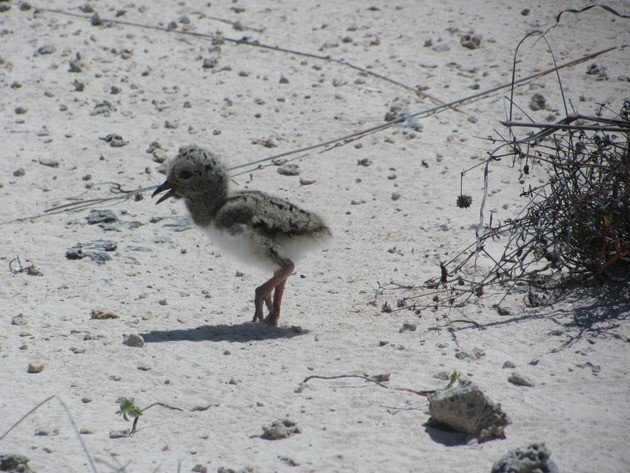 One of the surviving Pied Oystercatcher chicks in 2012 made itself famous right here. Although it looked promising in 2013 there were once again no Pied Oystercatchers that survived from these sixteen pairs. The tremendous success last year of one pair fledging three Pied Oystercatcher chicks was incredible! At the most northern end of the area that we monitor there has been a pair that have chosen to nest in a very rocky outcrop this year and although we knew there was a nest there we were not able to easily find it. Usually the footprints of the adult Pied Oystercatcher are easy to follow, but on a rocky outcrop there are no prints and when we accidentally startled the pair of Pied Oystercatchers a few weeks ago we knew they had a nest. Rather than try and find the exact location we chose to wait and see if the eggs hatched. 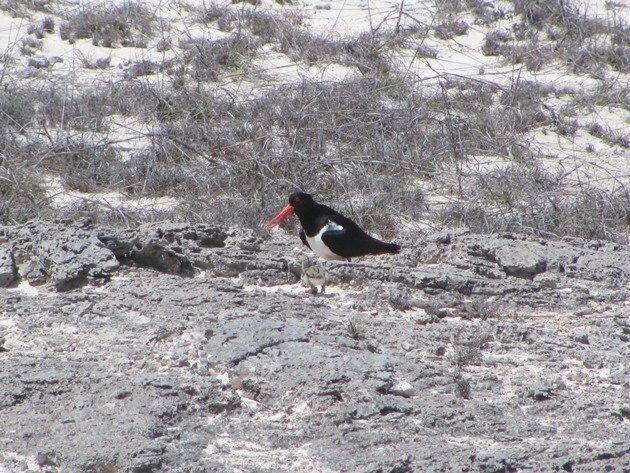 This week we were delighted when we were abused by the adult Pied Oystercatchers as we approached, because this meant that the eggs had hatched. 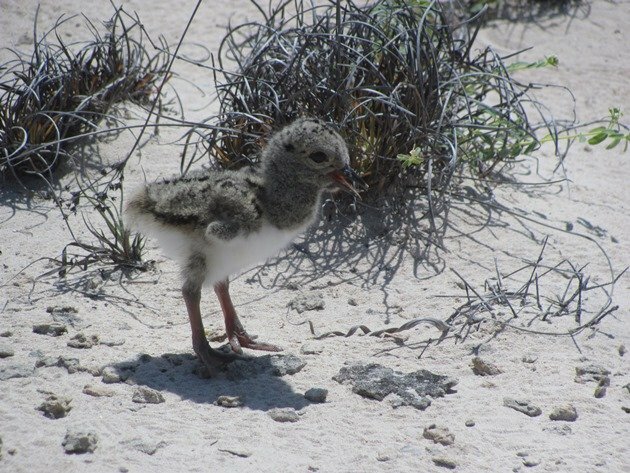 We were even more delighted to discover a Pied Oystercatcher chick that had only hatched out the day before and was out of the nest, which we could now take exact coordinates for. Initially it was well camouflaged on the rocks and the pattern on the back of the Pied Oystercatcher chick is unique to individuals. 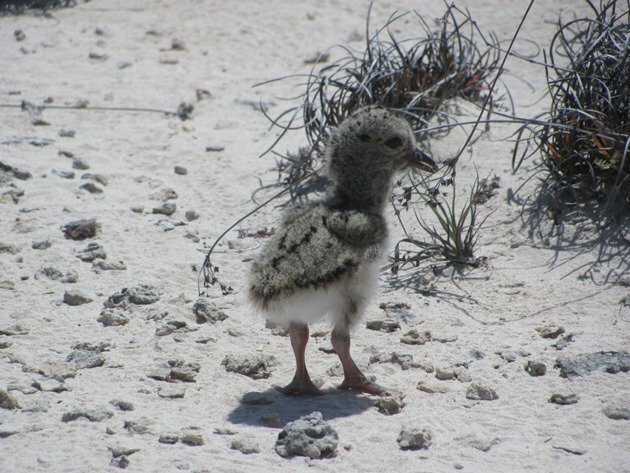 The Pied Oystercatcher chick then stood up on its thick legs and you really do question how something so large could have come out of an egg! 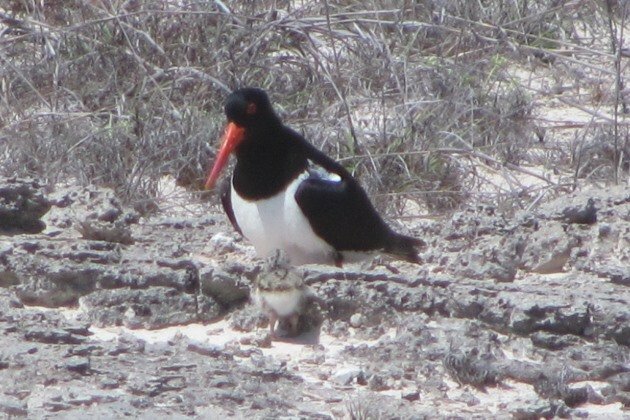 The Pied Oystercatcher adults were calling to the chick and it responded and ran over to where they wanted it. It was extremely well camouflaged on the rocks once again. 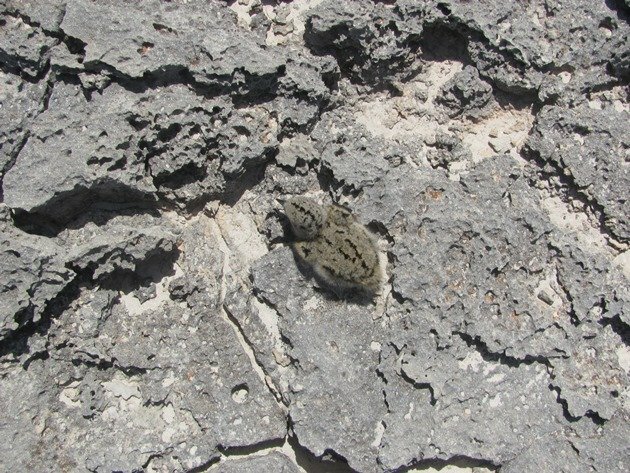 Now I realise you probably can’t even see the Pied Oystercatcher chick in the above two photographs, so I have zoomed in for you so you can see where it is! The Pied Oystercatcher adult sat down as the chick approached and it climbed up towards it and was subsequently pushed under the right wing into the shade. It is incredible that we have sixteen pairs of Pied Oystercatchers that appear to have everything against them in this part of the world. 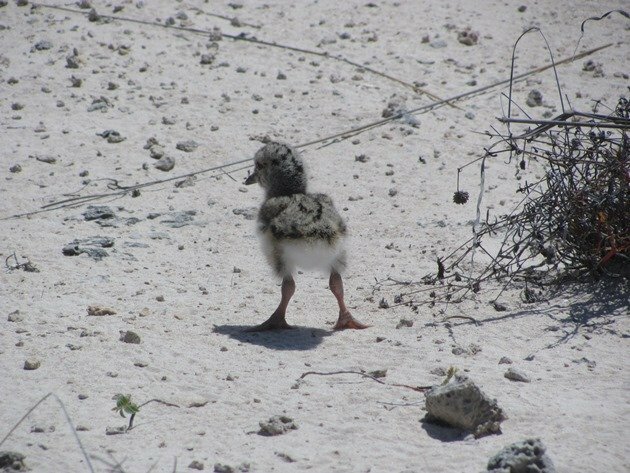 In fact we know of two other pairs that attempted to breed this year at Barred Creek and in Roebuck Bay and the longest either of the chicks survived was two weeks prior to predation. So, this is now eighteen pairs of Pied Oystercatchers that have failed to breed so far this breeding season, but we have our fingers crossed for the one remaining nest and the one remaining Pied Oystercatcher chick. UPDATE:- Sadly the chick was predated and the two eggs that were laid as a fifth clutch were not viable and did not hatch out. 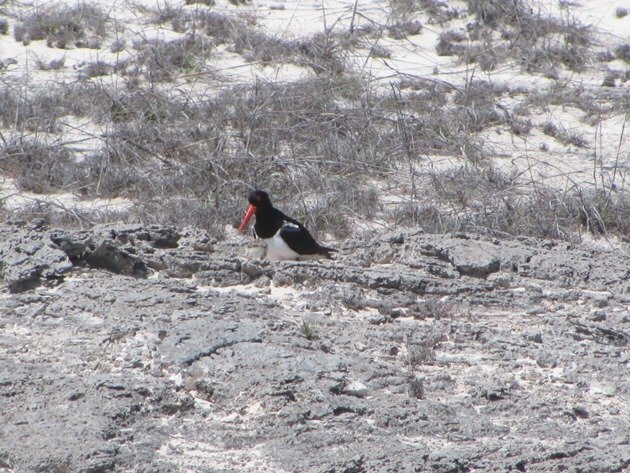 They remain in the open area some 6 weeks later with neither Pied Oystercatcher adult incubating any longer. The odds of survival seem so slim for your oystercatchers, and this sounds like the worst year ever. Each bird is a rare and precious survivor! That chick is absolutely adorable, and perfectly camouflaged. I hope it makes it! The odds really do seem against them, so we really do hope this little chick thrives and learns to fly soon. That is about 5-6 weeks away, though. Hi Clare and Grant , Thank you for sharing all this info, I am currently working on a public art project in Port Neill South Australia all about shore birds. I have been trying to find out the actual size of Pied Oystercatcher eggs infact I’m keen to find out the size of red capped plover and sooty oyster catchers eggs too. 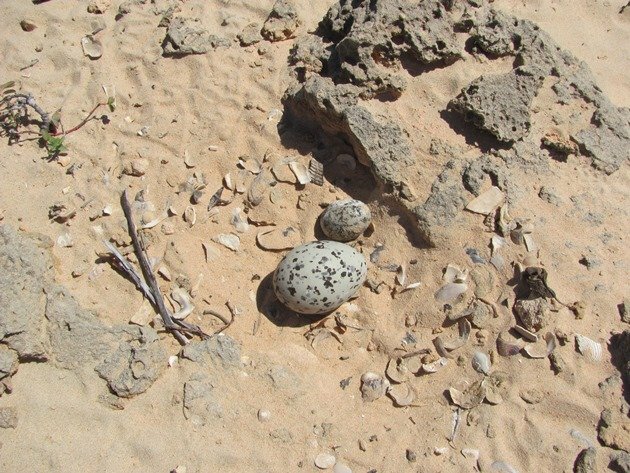 The only info I have found successfully is the Hooded plover eggs 37 x 27 mm or approx the size of a 20cent piece does that sound correct?. If you can find a Slater field guide you will find Pied & Sooty Oystercatchers listed at 63x42mm and Red-capped Plovers listed at 29x21mm. Want to Go Bird Banding in Amazonian Peru?